(Sept. 14, 2018) — Sergey “Krusher” Kovalev and Eleider “Storm” Alvarez lit up the Atlantic City Boardwalk in a pitched battle last month. The two will renew acquaintances early next year live on a Top Rank on ESPN card as part of a co-promotion with Main Event and Krusher Promotions, in association with Groupe Yvon Michel. Alvarez knocked down Kovalev three times in the seventh round and scored a TKO to capture the WBO light heavyweight title in a shocking upset. Kovalev led on all three judges’ scorecards at the time of the stoppage and hopes to pick up where the first six rounds left off. Kovalev (32-3-1, 28 KOs) established himself as one of this generation’s preeminent light heavyweight champions with nine title defenses across two title reigns. He first won the WBO title in August 2013, traveling to Wales and knocking out hometown champion Nathan Cleverly in the fourth round. He became the unified champion in November 2014 with a dominating 12-round decision against future Hall of Famer Bernard Hopkins and further enhanced his résumé with a pair of knockout wins against former lineal light heavyweight champion Jean Pascal. Kovalev lost the title via controversial decision loss to Andre Ward in November 2016. After dropping the rematch via eighth-round TKO, Kovalev recaptured the WBO title with a second-round TKO against Vyacheslav Shabranskyy in November of last year. He defended the title once before the first Alvarez bout. Alvarez (24-0, 12 KOs), a former Colombian amateur standout who resides in Montreal, is a nine-year pro with a host of A-list names on his résumé, including: Kovalev, Pascal, and former super middleweight world champion Lucian Bute. The Kovalev triumph is the signature victory on his record. Come 2019, Alvarez hopes it’s repeat rather than revenge. 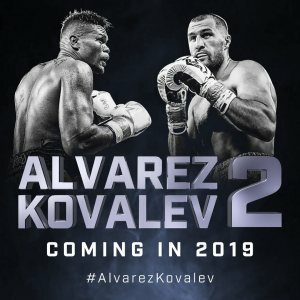 Use the hashtag #AlvarezKovalev to join the conversation on social media.